While the threat of coral bleaching as a result of climate change poses a serious risk to the future of coral reefs worldwide, new research has found that some baby corals may be able to cope with the negative effects of ocean acidification. Ocean acidification, which is a direct consequence of increased atmospheric carbon dioxide levels, is expected to have a deleterious effect on many marine species over the next century. An international team examining the impact of ocean acidification on coral has found that a key reef building coral can, over a relatively short period of time, acclimate to a doubling of atmospheric carbon dioxide levels. 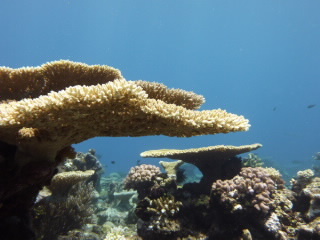 “Our aim was to explore the effect of a more acidic ocean on every gene in the coral genome,” says study lead author, Dr Aurelie Moya, a molecular ecologist with the ARC Centre of Excellence for Coral Reef Studies at James Cook University. The researchers exposed baby corals from the Great Barrier Reef to acidified seawater for varying lengths of time and investigated how they responded at a molecular level. “We found that, whereas 3 days of exposure to high CO2 disrupts formation of the coral skeleton, within nine days the baby corals had re-adjusted their gene expression to pre-exposure levels. Longer exposure seems to be less detrimental to coral health than we had assumed based on shorter-term studies,” Dr Aurelie Moya says. “We saw that within a few days, juvenile coral adapted to CO2 levels double those experienced today with no obvious disruption to its life processes,” says study co-author, Professor David Miller, who leads the molecular biology group in the Coral CoE. Professor Miller says the findings are particularly significant as they centred on staghorn coral. The research team examined tens of thousands of coral genes and was able to identify those that were responsible for enabling acclimation to high carbon dioxide. Dr Moya says the study is an essential first step to better understand how reef building corals adapt to environmental stress. However, both Dr Moya and Professor Miller remain cautious about the ability of corals to tolerate the combination of increased carbon dioxide and climate change. “This study focused on one single stressor, ocean acidification, but we must keep in mind that the combination of several stressors, such as ocean acidification and warming could lead to larger impacts on baby corals,” Dr Moya says. 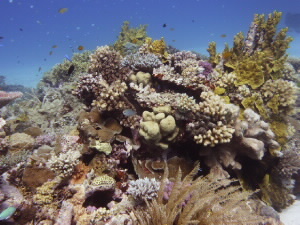 Rapid acclimation of juvenile corals to CO2-mediated acidification by up-regulation of HSP and Bcl-2 genes by Aurelie Moya, Lotte Huisman, Sylvain Foret, Jean-Pierre Gattuso, David Hayward, Eldon Ball and David Miller is published in the journal, Molecular Ecology.